Last in this series from 1976. The Randwick park that was a tram track. 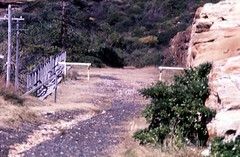 Another view of the Randwick reserved track, as it looked in 1976. 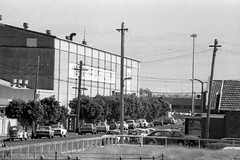 A view (in 1976) of what was left of the extensive tram reservation that ran from Randwick tram workshops up to the main shops. Trams were also on reserved track along Anzac Parade, and alongside Alison Road and Centennial Park. Whilst some of this reservation was belatedly used for buses, other parts have been lost forever. What a short-sighted waste (IMHO). 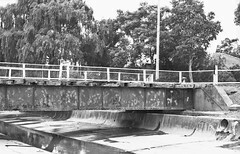 Another view of that neglected tram bridge in 1976. Has it been restored since? 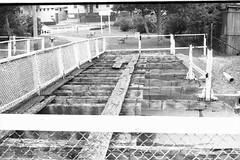 There was reserved track including bridges for the Annandale and Glebe trams. Rozelle depot is nearby. This is how it looked - neglected - in 1976. 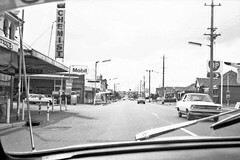 This looks like Bunnerong Road in 1976. Another old tram route lost. 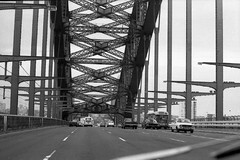 Heavy traffic on the Harbour Bridge, 1976... yeah, right. This is heading north on the main roadway. It was intended to carry trains on the left (and it does) as well as the right (which it doesn't, and didn't, except on "maximum load test" day back in 1932). It did carry trams, however, with an extensive system on the north shore and an underground platform at Wynyard. All gone, replaced with cars, cars, cars and the odd bus. Loftus tram museum, as it was in 1976. Sydney had one of the world's largest tram networks prior to about 1950... but it progressively got pulled apart in favour of buses, finally closing in 1961. We were left with trampaths in bushland settings, or weird reservations in the middle of roads... and the odd bit of steel in the road surface. 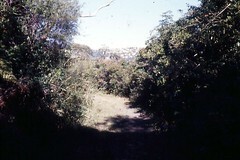 I'm guessing this is the trampath from the Spit to Manly, as it was in 1976: overgrown. It could be the path to Balmoral (similarly overgrown) but I'm going with Manly. From a small clearing on the Manly side of the Spit Bridge the trams went up a twisting climb on the eastern side, joining up with the equally interesting old road up on Sydney Road. 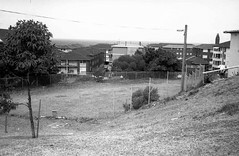 It was reserved track here in this pic, and again when it dropped down into Manly proper, leaving the road in an arc to the east (now home units) as the descent steepened, then west into the parkland surrounding the oval before joining Raglan Street. There's a small monument at the Spit clearing and you can see the old bridge remains on the western side of the "new" bridge (ha, ha - I write "new" in an ironic sense). The old road goes west and climbs in a scenic fashion up to Sydney Road. 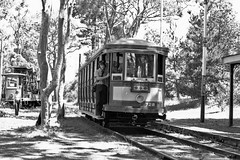 It was a long and winding reservation for trams up (and then down) to Watson's Bay. Plenty remains, including some interesting cuttings and tight curves that can be explored on foot... this is how the terminus looked in 1976. A view of what appeared to me at the time to be Sid Marshall's "outdoor" collection on a smallish block of land next to Bankstown Airport. You don't find this sort of treasure trove these days. It's circa 1974 I guess, give or take. The sort of thing you went to Bankstown to see in 1976... The ex-Ansett Marshall Airways L10A Electra VH-ASM. Your typical sort of late 1930s airliner, really. 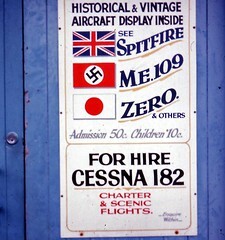 The sign on the door to the Marshall Airways hangar says it all really. It's sometime in the 1970s I guess and you can see a Spitfire, an Me109 and a Mitsubishi Zero for 50 cents (adult). That's good value, eh? A DH Tiger Moth, at least 6 DHC Beavers, a DC-3 over near the Hawker de Havilland factory... and a Mobil fuel tanker. It has to be Bankstown Airport in 1976, surely? The de Havilland factory at Bankstown churned out Mosquito bombers during WWII, but had resorted to making recreational boats to keep, umm, afloat. They also maintained and restored some interesting aircraft over the years. These days they make parts for companies like Boeing. Tiger Moths at RAAF Schofields Sept '76 - or was that HMAS Nirimba? An Air Show at where? Schofields? Well yes. It was a Naval Air Station (HMAS Nirimba) for many years, boasting an intersecting set of 3 runways in a triangle formation. 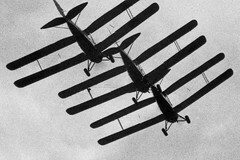 This is a shot from 1976, showing Tiger Moths in formation during one such air display - before we lost yet another airport. Of course it wasn't always HMAS Nirimba. First of all it was land occupied and managed by the Darug peoples for thousands of years. 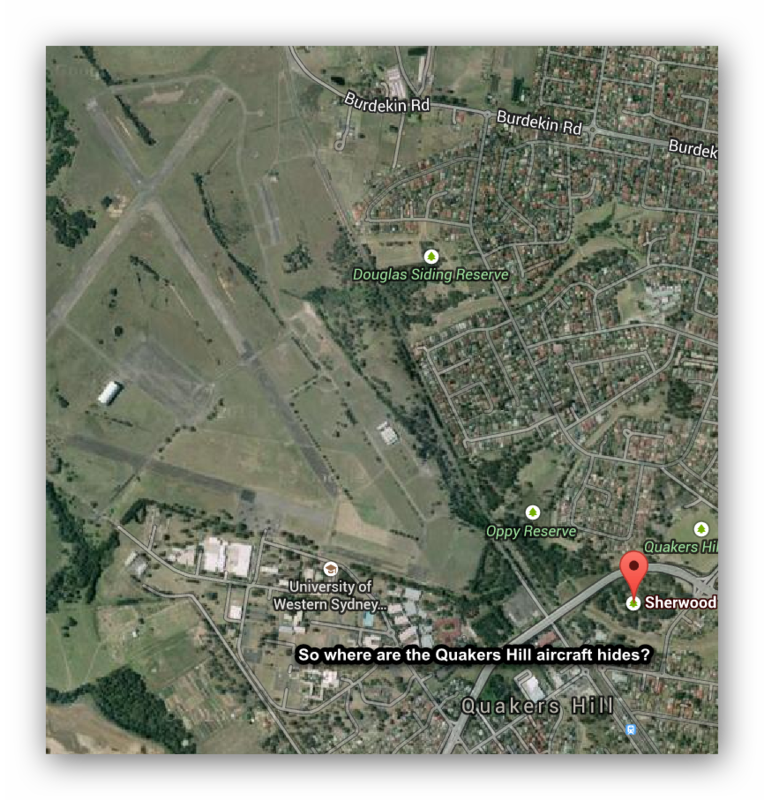 Post-invasion, 2 land grants were made in 1814 and 1816, to Major West and John Pye respectively, forming the essential extent of the future Schofields Aerodrome, Quakers Hill, site. The land was duly acquired in 1941 as a satellite field to RAAF Richmond. Construction commenced in 1942 but with the formation of the British Pacific Fleet in November 1944 it was decided to allocate the airbase to the Royal Navy (RN) as a MONAB (Mobile Naval Air Base). MONAB III arrived and the base became the RN's HMS Nabthorpe on 5 February 1945. However just a few months later, in November 1945, the RN shut down Brisbane-based MONAB VI, or HMS Nabstock, and transferred most of its personnel and equipment to Schofields. Thus Nabthorpe morphed into Nabstock. Following the war's end the Royal Navy vacated the base (c.1946). It duly reverted to the RAAF and once again became known as RAAF Schofields. But not for long! In 1952 the RAN moved in, re-establishing a naval atmosphere. The base was duly commissioned HMAS Nirimba, RANAS Schofields, on 1 April 1953. 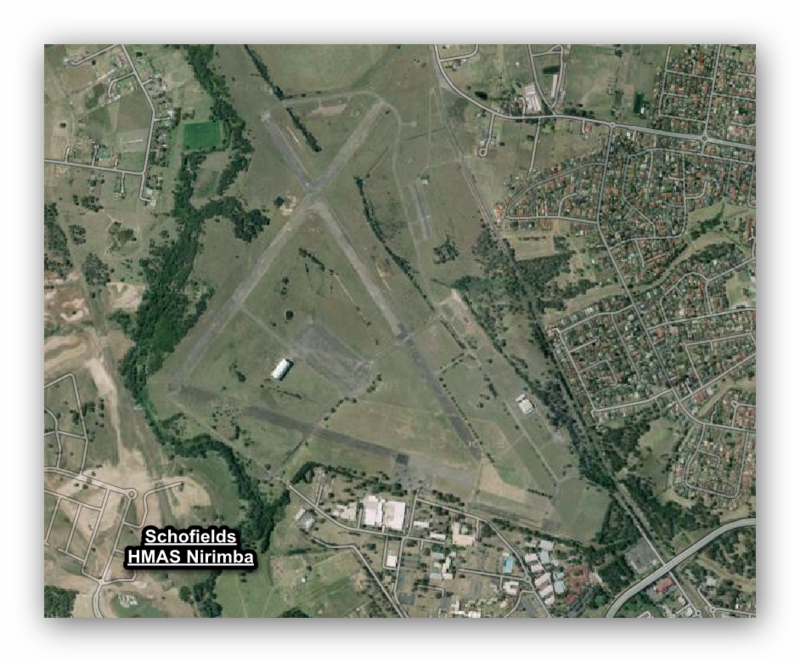 Or maybe that was Royal Australian Naval Air Repair Yard (RANARY) Schofields. No, it wasn't an April Fool's Day prank. Whilst the plan was to make it an aircraft repair facility as well as an aircraft technical training school, it was the training function that umm, took off. Why Nirimba? Naval air stations were traditionally assigned the names of sea birds, and the name 'Nirimba' is derived from an Eora Aboriginal word meaning 'pelican'; thus the pelican became the main theme for the HMAS Nirimba crest. Sadly, according to one source, the responsible Federal politicians and adminstrators were heavily lobbied by the local aviation industry to get out of the aircraft repair and maintenance side of things and, of course let private industry do that instead. And the RAN being about ships not planes (at least in the eyes of some) it came to pass that on January 4, 1956 RANAS Schofields (or was that Royal Australian Naval Air Repair Yard (RANARY) Schofields?) was decommissioned. And on the following day the Royal Australian Navy Apprentice Training Establishment (RANATE) was commissioned instead. To complete the bureaucratic/administrative side of things and lend an air of gentle farce to it all the name Nirimba was also decommissioned on 4 January; but like a Phoenix rising from the ashes, it was recommissioned the very next day. Of course it didn't last, but it had a good run. Nirimba finally decommissioned - for good, in an RAN sense - on 25 February 1994. In time most of the land, well the southern or building-side of the base, anyway, passed into the hands of the University of Western Sydney and other educational institutions. The name 'Nirimba' thus lives on as an educational precinct. A good source of naval-era pics here. When it was operational, both as Nirimba and as a civil airfield, it was probably just a bit too close to RAAF Richmond: big brother was always watching. Although it was a nice, quiet and well-designed place to do touch-and-goes, as I did as a student pilot during the late '70s, you had to be precise. 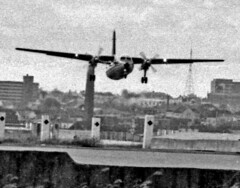 As long as you kept clear of Richmond's airspace and its all-seeing radar, all was fine. But should you cross that invisible line - watch out! 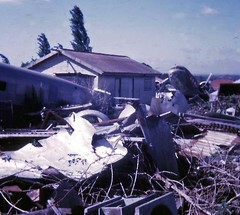 There was an aero club building in the north-east corner and the HMAS Nirimba facility itself to the south. One day in - I think - the early or mid 1970s a DC-3 landed at the strip and parked near the aero club. Before it flew away a fence was erected to cut the long strip somewhat shorter. No, I don't know how it left the field - presumably by truck? 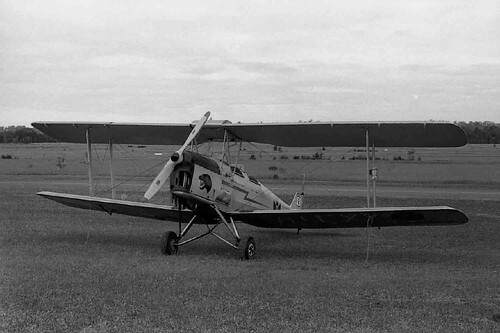 Another Tiger Moth at Schofields, 1976. Schofields aerodrome was also a motorsport venue from 1950-59 (possibly that conflicts with the RAN records of operation there in 1953, though - shared use?). The RAAF airfield data c.1944 describes three intersecting, graveled runways with "flight strips" (cleared, grassed and semi-prepared runway) either side. The graveled runways were 150ft wide and measured 3965, 4575 and 5030ft each in length, respectively. The adjacent flight strips were also all 150ft wide but measured 4400, 4975 and 5380ft respectively. 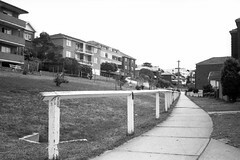 In 1944 dispersal was incomplete (no confirmation on completion) and partially constructed hideouts were situated in "sparsely timbered" sections of Quakers Hill. The pre-existing roads of the town were widened and cleared to give enough width to taxi aircraft (to the hideouts!). The graveling of these taxiways was incomplete in 1944. A few huts and old farm houses reportedly occupied the western side of the intersection of two of the flight strips. 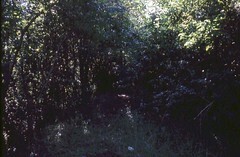 By 1944 three hideouts were cleared, two were wire meshed and five others were cleared and formed. 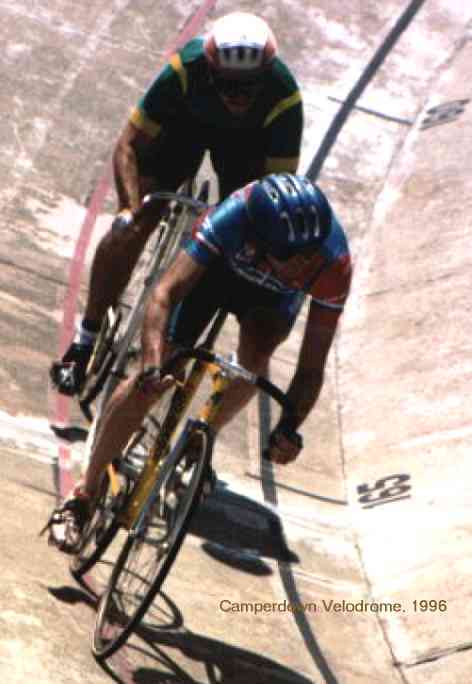 Schofields has been closed since c.1994, although some operations were reported up to 1998. Now a housing and educational site, with aerodrome land, including a 'blimp hangar' and remaining portions of runway on sale from 2008. Grab yourself a bit of history. Some more detail available at There's a War On! More detail on RN MONABs. It's a queue for takeoff. 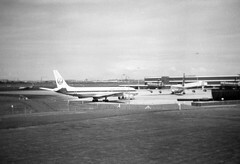 Looks like a DC8 lined up on runway 16, with a waiting gaggle consisting of a TAA 727, an EWA F27 and a couple of Ansett DC9s. And look in the background for Sydney to the north and east, including the Sydney Harbour Bridge on the right. This is 1976 and I'm guessing that is a very early shot of an incomplete Centrepoint Tower, far right. Another view of Sydney's skyline, including a much more complete Centrepoint tower... this is looking north from near the crossing of the (then) 2 runways at Sydney Airport (1979). 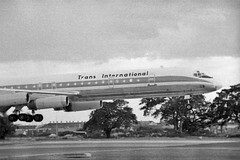 That's a Malaysian DC10 of course. Ouch, that hurt. If I remember rightly VH-EWL came down outside of Bathurst, the victim of windshear during a storm. It hit high ground on approach (or was it departure?) and basically landed, ummm, prematurely. No-one was seriously injured (to my knowledge) but the airframe was flattened on the bottom as it skidded along... it ended up here on the Condell Park side of Bankstown, up against a low fence. Whilst the markings were clumsily obscured it was pretty obviously the F27 "Friendship" in question! 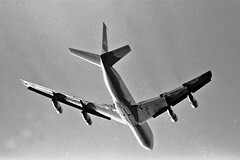 "PROBABLE CAUSE: "During the climb performance of the aircraft was adversely affected by an unpredictable encounter with a large change in the horizontal wind component, and an associated downdraft, at a height too low to effect recovery." (Dept. of Transport Australia Accident Investigation Report 76-2) "
Worth a mention: there was a WWII military bunker nearby to this site, on the hill behind this shot. I'll post more on that later but it was a seriously large and well hidden centre. Sydney Airport was a great place to visit in the 70s. You could move around with ease and no-one really cared what you did. So there I was one day sitting atop a shipping container near the Adastra hangar when this TIA DC-8 Super 63 thundered past my lens. It's runway 25. This was the most interesting part of Sydney Airport in many ways, with a great view of the "short" runway plus the old Lincoln fuselage to look at across the swamp (used for firefighting practice). Behind those trees is the burned out wreck, with 2 tailplanes just visible (if you have enough imagination). 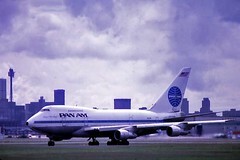 A Pan Am 707 once over-ran the runway whilst taking off on the reciprocal (ie 07, not 25). Apparently a victim of bird-strike, it ended up in the mud at the end of the strip. That was about 1970 or so. A few years later a Pan Am 747 landed long on 25 and did a hard-right turn to just miss the main sewer outfall (and Cook's River). A moody shot of the TAA maintenance hangers in 1976. Sydney Airport still had some rustic charm away from the 2 main domestic terminals, including some old residences that had been taken over, undeveloped grassy blocks and easy all-day parking. Out of shot behind me is the Adastra hangar where a Lockheed Hudson could be found lurking, as well as some remains of the old Pony Racecourse and Lord's Rd "Balloon Loop" for the trams. Behind that F27 (VH-MMR) you get a slice of Sydney to the north and west in 1976. That TV transmission tower is on the northern side of Sydney Harbour (and yes, I was using a long-ish lens!). The F27 has lifted off on runway 16 and has just crossed the east-west runway, if that helps. The chimney is the St Peters brickworks, what is now Sydney Park. 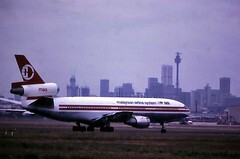 As viewed from Sydney Airport... looking north from the area just west of the tunnel, 1978. The "new" Sydney International Terminal just after opening. 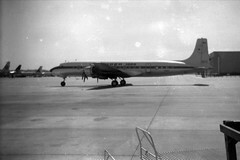 It's 1969 again and Sydney Airport, folks it was and taken with a Kodak Box Brownie... not great quality but (once more) a rare bird worth sharing; and once again I simply walked through the gate and literally walked all around this RAF Comet without question. Can't do that these days.